A preview of what’s to come on the two’s collaborative mixtape Tracking Numbers. Berner and Young Dolph's collaborative mixtape, Tracking Numbers, is due out later this month. 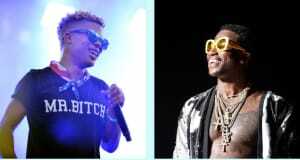 To give fans a hint of what to expect from the tape, the two released "Knuckles" featuring Gucci Mane on Wednesday. Earlier this year, Young Dolph featured on Gucci's Droptopwop album. He and 2 Chainz appeared on "Both Eyes Closed." Tracking Numbers is out August 25.